Me Made May #5 remembering my first garment… – Go ask Alisa – DIY capsule wardrobe one stitch at a time! It has been quite some time now, I have been sewing for a bit over two years, or maybe just a bit under two years… I think, it has been such a journey of passion and enthusiasm, creativity and experimenting that time passed by so quickly and unnoticed. I don’t think I have ever posted this project, but I DO wear it quite often: it is my first ever sewn garment! Oh, I remember that trip to Jo-Ann’s: anticipation and excitement, I had no idea of what I am just about to get myself into… So to begin with sewing I decided to go the easiest way – to go without a pattern. The fabric was slinky and stretchy, which I assumed was some sort of jersey stretch material, which would probably take the shape of my body. I was halfway correct on this one: it did take the shape of my body, but because I knew nothing about different needles and treads – my first try and take on this fabric turned into a complete disaster!!! My needle broke, my thread got all tangled up in a bobbin – I was ready to call it a day and give up on this monkey business. Luckily, Jared was there to calm me down, he made me a hot cup of tea and it for sure made it all a tiny bit better. Long story short – it took me almost 3 days to finish this simple project, but I could not be more proud 🙂 My first one saw the light of the day and I am still proudly wearing it! Pattern: I measured length of my shoulders and desired lengths of the garment, in my case till the hip line and cut a square. Yes, I actually did trace the square on the paper and then cut it out while pinned to the fabric. After I marked my neckline, which was also rather easy to do. Because I had no idea how would I sew the neckline, I was just about to learn the magic of bias binding and working with knits and jerseys, so I came up with something interesting! 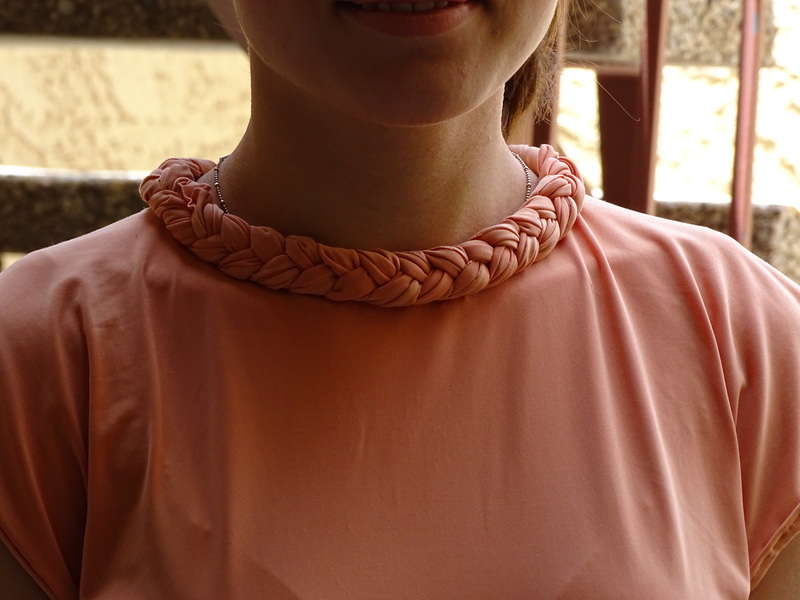 With the leftovers from my fabric I braided long enough piece to go around the neck, and then I hand stitched it in place. Because fabric is jersey I did not need to worry about it unravelling and ruining the garment. Additions: It is a perfect top to wear for a shopping trip, or for a quick walk in a park, or with a pair of sweats at home. Today I paired it with tan pants and my favorite high-top Converse! I especially love the neckline detail – my first make, but I find it quite original 🙂 Enjoy! Lovely color and neckline detail! Very creative!